A subject of what seems like constant buzz here on iSlaytheDragon.com is a little card game called The Resistance. Designed to handle five to ten players (with the ideal range probably being seven or eight), The Resistance combines logic, bluffing, tension, and discussion into a streamlined, phenomenal package. It is available from Indie Boards & Cards wherever good games are sold, and while what’s physically included in the box is only cardboard and wood, don’t let the $20 pricetag scare you off: this is a game you’ll want in your collection. Read on for our detailed opinions. 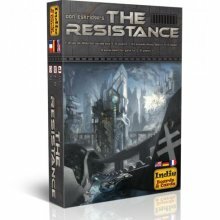 The Resistance is a social deduction game for 5-10 players. It is almost completely card based. The premise of the game is that the players are members of the resistance, a secret group trying to infiltrate a corrupt government and carry out three successful missions. However, mixed among the group are a number of government spies who are trying to sabotage the missions. Gameplay continues until either the resistance successfully carries out three missions or the spies successfully sabotage three missions. Missions are where things can get tricky. Each mission team member is given two cards–a blue pass card and a red fail card. Resistance operatives must play their pass cards (obviously–they want the mission to be successful). Spies may play the pass or fail card, either trying to hide their identity or outright sabotaging the mission. Here’s the kicker: only one fail card is needed for a mission to fail. The leader takes the mission cards that were played, shuffles them up so no one knows who played what, and reveals their result. (I like to turn them over slowly, dramatically. I think it adds to the tension.) A blue score marker is used if the mission passed, a red score marker if the mission failed. If the mission passes, people will congratulate each other. If it fails, the finger-pointing begins. Leadership passes to the next player, and the game continues until three blue or three red markers appear on the scoreboard. My first experience with mafia was during my freshman year of college. I didn’t mind playing it, mostly because I was pretty quiet and the quiet people can usually slip into the background. Then when I became a block mentor, who welcomes freshmen into the college, I introduced it to them because, let’s be honest, how many games can incorporate 30+ people and be played on a bus? I have since learned the error of my ways. I don’t like mafia anymore, with good reason. First of all, any game with player elimination doesn’t sit well with me (which is also why I don’t care for Bang! ).Second, now that I’m more outgoing when I play games, I’m always the first to die. If the mafia doesn’t get me in the first round, the townspeople become suspicious, and I get lynched. So…I’m normally the one getting snacks or doing something else, wishing I had a smart phone to use for the next half hour while the game continues without my influence. In fact, it was a game of mafia gone south that led me to seek out an alternative. And now that I’ve found The Resistance, I will never go back. When I first heard about The Resistance, I didn’t see what the big deal was. Now, having played it almost twenty times in the past month, it has quickly become one of my favorite party games. Here’s why: it’s fun to play no matter who you are. Whether you are a spy or the resistance, whether you are the leader or just a voter, the game is a blast. In fact, I think I like playing a resistance operative better than playing a spy. Another thing to recommend The Resistance: it is easy to learn. There aren’t extraneous rules to get in the way of the discussion. Almost every game decision is binary: approve/reject; pass/fail. The day after I bought the game, I played it with a group of nine people, ranging in age from young teens to their grandparents, with many ages in between. Everyone caught on and had a great time. In fact, we played six times in a row. Which brings me to the next positive thing about The Resistance: it plays fast. If you don’t have tons of time on your hands but still want a satisfying group experience, The Resistance will give it to you. Most games play in less than a half hour (in fact, I can’t think of a game that was longer). The Resistance does a great job of facilitating discussion. One player commented during a team-nomination discussion that he never got to go on missions and thus didn’t get to play. @Futurewolfie nailed it when he said, “This is the playing. Going on missions is just choosing cards.” It is also a very intense game that keeps players interested. I love how it keeps everyone involved the whole time. Since no one is ever eliminated, even players who the other players “know” are spies can still participate in the game. In fact, in one game, my wife threw me under the bus, and everyone believed her that I was a spy (she was, in fact, the spy). Most of the game no one listened to me, but I was finally able to persuade the true resistance members in the eleventh hour to trust me, and we squeaked by with a victory. The game is certainly stacked in favor of the spies, but that makes the resistance victories that much sweeter. I should also mention that the game comes with an expansion, but I’ve never used it. The game is fun on its own and doesn’t really need it (at least yet—the expansion, however, looks like it levels the playing field a bit more between spies and resistance operatives). If you’re looking for a great group game and your group doesn’t exceed 10 often, get The Resistance. You won’t be disappointed. Party games and I have somewhat of a long and yet rather uninteresting history. Most party games fall under the category of “trivia” or “word-guessing” games. I’ve always joined in and had fun because that was the point, but most party games are not really satisfying games within themselves. Enter The Resistance. Resistance is the most enjoyable “party” game I have ever played. It is fun. It is so fun that I stopped at a gaming store on the way to my camping vacation to buy it the day after I learned it for the first time, because I wanted to introduce it to my family. Resistance is a game thats value is far greater than the sum of its parts. For $20 you get about 60 cards, 1 tiny cardboard rectangle, and 7 wooden tokens, all in a box that can fit in your pocket. I’m all about getting value for your money, and in this case, the price tag is fully worth it. @FarmerLenny covered it pretty well above, but I want to reiterate something I feel is important to understand: the meat of the game is discussing (usually in loud and accusatory voices—okay, arguing) who you think might be a spy. The mechanics of voting and mission passing/failing are simple and easy to learn, but something I’ve noticed with beginning players (including myself) is the tendency to expect those mechanics to logically reveal who the spies are. So I’ll just say it outright here so everyone knows: this is not a “process of elimination” game or a “logical deduction” game. There are not enough missions to narrow down spies based on the evidence of passing and failing. Unless the spies make a stupid mistake—such as 2/3 of the people sent on the mission are the spies (and there are only 2 spies on the game) and they both throw “fail” cards; that will narrow down the potential spies real well—there won’t be enough physical evidence to vote out the spies. This game is about analyzing and reading people. It’s about trying to figure out if people are lying or not, based on their tone of voice, their choice of words, how nervous they seem, if they avoid your eyes. It’s about reading body language, listening, perceiving, and judging. That’s why the discussion is so important. You have to challenge people, question their motivations in ridiculous ways, and watch how they react. You have to build opinions on who to trust, and then take their opinions into account. If I’m making this game sound very hard, well, in some ways it is. But the truth is, the more you play, the more you learn. As you take turns as a spy, you learn how to hide your true motivations. As you play a Resistance member, you learn what to look for to detect both Resistance members and spies. And if you pay attention to what you do, you will learn how to do better as the OPPOSITE role of what you currently are. And ultimately, the fun is in the discussion—it’s in the accusatory remarks and personal challenges of character that happen during the discussion phase, so even if you aren’t the best at figuring out who a spy is or pretending not to be one, you can still have fun because you can still argue. Which brings back a key point: non-elimination. Even if everyone thinks you are a spy, you can still argue about it or try and misdirect them to protect the other spies. You still get to PLAY and participate in the fun part of the game. I should point out a few “tough” spots. The game scales based on number of players involved—a different number of spies and different numbers of people sent on missions—but the difficulty for each group does not scale well with it. With five players, it is very hard for the spies—they just tend to stand out. Seven is probably the perfect number to play with. I played a game with ten, and it was insanely hard to analyze all those people and figure out who the spies were, and such a large number of spies that it was too easy for them to win every mission. Environment can also have an effect. This game is best played with enough lighting to see the other players clearly, but in a relatively quiet and dim environment so you can listen and analyze. I tried playing on a beach, but again, it was so bright, hot, with a lot of activity around us that it was impossible to really analyze anyone. Even with these detracting factors, the game was still incredibly fun to play, even when the resistance members lost. We haven’t used the expansion cards so this is not an official review of them, but I’ve glanced through them, and they seem like they would help a lot with balancing games with more players. They give certain players limited abilities to see other player’s character cards, facilitating discussion, which seems like it would help a lot with an 8-10 player group. My final recommendation is to make sure you show everyone all the character cards at once. There has occasionally been some confusion resulting from not having knowledge of what the other card looks like, making it hard to interpret what you’re supposed to be looking at to determine the color of the card. Especially with the [blue]resistance card featuring an image of a girl with red hair – red being the color of the spies. Actually, the team voting cards can be a little confusing as well – the card backings look exactly like the “yes” vote, and the mission pass/fail cards both have circular icons with dark colors that can be hard to distinguish without looking carefully. Even the Leader card is a little confusing – instead of being double-sided with the Leader icon, the card back is the same as the Loyalty card back. Make sure you don’t pass your loyalty card instead of the Leader card. Previous ArticleFriday Question: What Game Is the Tensest? Nice review. I was actually debating about 5 minutes before you posted this whether or not I should buy this game. Now I’m thinking I will, and so the debate is whether I think they’ll be at GenCon or if I should order it from their site (where they donate $1 to Heifer International). Yes, that is a better debate. The game is certainly worth purchasing. I just want to add that even though I hate arguing in real life and try to avoid it as much as possible, I still love this game. Yep, I’ll be there. It’d be cool to meet up and play some games – I’m more than willing to let this be one of them.